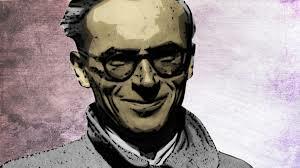 Hugo Distler (June 24, 1908 – November 1, 1942), German composer. Born in Nuremberg, he is known mostly for his sacred choral music. He attended Leipzig Conservatory first as a conducting student with piano as his secondary subject, but changing later, on the advice of his teacher, to composition and organ. Once Hitler came to power, the great minds of that period began scattering out of Germany — people like Albert Einstein, Theodore von Kármán, Paul Tillich, and Bruno Walter. Goebbels named composer Paul Hindemith a cultural Bolshevist and a spiritual non-Aryan in 1934. Hindemith wound up at Yale, Einstein at Princeton, and von Kármán at Cal Tech. Distler was only 25 when Hitler took over — the newest musical talent of his age. He’d just been made head of the chamber music department at Lübeck Conservatory, and he was still too young to be a target. Yet he was driven by spiritual imperatives that cast a whole new light on traditional church music. He brought the declamatory joy of baroque composers like Heinrich Schütz to the foursquare old melodies of the German Reformation. His music was quirky but beautiful, tonal yet chromatic. He made the old melodies dance with delight. It is a sound utterly unlike any other. Once you hear it, you don’t forget it. But it was a sound heard in the wrong place at the wrong time. His work is polyphonic and frequently melismatic, often based on the pentatonic scale. Because of these characteristics, his work was stigmatized by some Nazis as “degenerate art.” Distler enjoyed his first success in 1935 at the official Kassel Music Days (Kasseler Musiktage). Review: Because so much emphasis is currently placed upon the fate of Jewish composers under the Nazis, it is easy to forget that there were some German musicians who also suffered as a result of the repressive policies of the regime. Among those that can be singled out in this respect is Hugo Distler, a highly talented church organist and choral conductor who committed suicide at the age of 34 in 1942, on learning that he had been called up for military service. The two large-scale works presented here offer typical examples of the so-called Orgelbewegung style drawing their inspiration from Bach in the trenchant use of chorale and Schutz in the density of polyphonic argument. 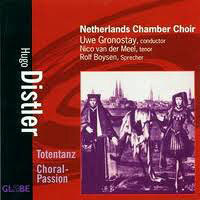 It’s a tribute to Distler’s mastery and the outstanding singing of the Netherlands Chamber Choir that despite this obvious musical provenance, both works strike an individual voice and sustain one’s interest without the textural variety of an instrumental accompaniment.